The Crown is yet another Byron Brooks invention, marketed in 1894. . The typewheel (pic 6) is turned into position by sliding the index pointer. An ink roll keeps the wheel wet. Printing is done by pushing the entire mechanism down onto the paper. There are two equally rare version of the short-lived Crown index typewriter. The earlier has a straight front. The later mode, shown below, had a curved front but was mechanically virtually the same. 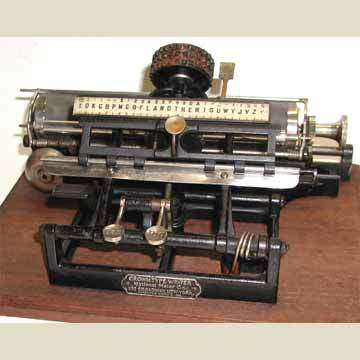 Note the two shift keys for capitals and figures (pic 5) that would push the typewheel up. 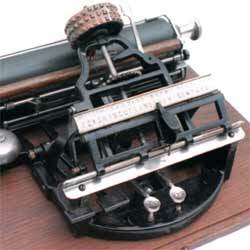 Byron Brooks was actually the inventor of the shift system, as it originally appeared on the Remington 2.